It’s a typical scene these days. You follow a sports team and want them to make it to the playoffs this year. Then an injury happens to one of their superstar athletes and the team falls apart because the player will miss the rest of the season due to surgery. Is there a better way? Can that injured player avoid surgery and come back quicker? Sports injuries and pain can bench even the strongest athletes, and recovery times for those choosing the traditional surgical approach can be lengthy. For athletes used to routine and often heavy training schedules, these long recovery times can be frustrating at best. And in many cases, once an athlete goes “under the knife” for an injury, a return to his or her full athletic ability prior to the injury is unlikely. In regenerative medicine, with customized and advanced orthobiologics and intervetional orthopedics, many athletes with sports injuries don’t have to settle for slow recovery times. Orthobiologics include a broad range of nonsurgical treatments (e.g., platelet rich plasma [PRP], stem cells, platelet lysate, cytokine products, etc.) for orthopedic injuries. For an injured athlete whose goal is to get off the bench and back in the game faster, it’s a good idea to explore your orthobiolgics options. 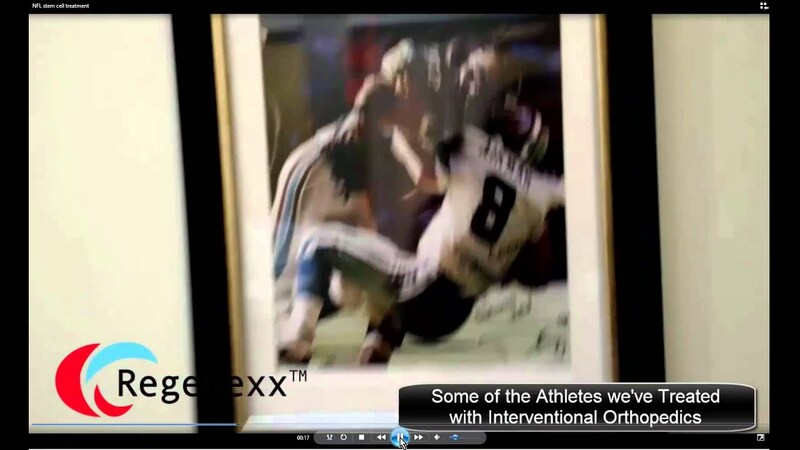 Which Athletes Most Benefit from Stem Cells and PRP? A college track-and-field athlete wanting to avoid hip surgery due to a labrum tear is able to jump hurdles again following a PRP procedure using super concentrated platelets (SCP), something he wouldn’t have been able to do had he underwent the surgery. New England Patriot two-time Superbowl champ plays ball again and attributes his success to a platelet lysate procedure on a disc in his back and a stem cell procedure on his knee. An elite high-school basketball athlete with a meniscus tear returns to the court pain free for the first time in over a year following her platelet lysate procedure. A 45-year-old triathlete with bad arthritis and knee pain competes in a triathlon just four months following her stem cell procedure. A middle-aged triathlete with knee pain, two failed arthroscopic knee surgeries, and loose knee ligaments (ACL and MCL) finishes Ironman following stem cell and platelet lysate procedures. An International Federation of BodyBuilding (IFBB) professional competitor with a herniated disc, bulging disc, and facet joint cyst returns to competition after stem cell and platelet lysate procedures. Surgery is a big deal, whether the approach is open (cutting open the skin and tissue to reach the injured site) or arthroscopic (inserting instruments through a scope through puncture wounds in the skin). Both are very invasive, and both require lengthy recovery times depending on the procedure. In addition, once something is cut or removed (pieces of the meniscus for example), it can often never be put back the way it’s supposed to be, making a return to full function difficult at best, but in many cases, impossible. The surgical recovery time for a dislocated shoulder, for example can be 3–6 months, and still movement would be limited. Full recovery, if it ever happens at all, could take up to 12 months. Surgery on the anterior cruciate ligament (ACL) is another good example. NBA players as a whole tend to suffer a lot of ACL tears, and surgery on the ACL can result in players being benched for six months or longer. In addition, at that point, they may not even have recovered half of what they were capable of before they were injured. Slow recovery times aren’t the only problem—reinjuries are common following surgery as well. Rotator cuff tears, for example, have been shown to retear in 6 out of 10 patients undergoing rotator cuff surgery. Constant reinjuries not only add to recovery time but can end a professional athlete’s career. When we read about or hear about athletes getting surgery, it’s always that same song and dance: they’ve tried everything—therapeutic massage, physical therapy, steroid injections, and on and on. Surgery is their “last resort.” But the truth is, unless they’ve already seen an experienced, interventional orthopedic physician who’s said stem cells or platelets can’t help (there are some severe conditions that truly do require surgery), surgery may not be the last resort. Let’s take another look at our ACL example, but from the other side, the nonsurgical regenerative-medicine side. The common traditional belief is that ACL ligament tears don’t heal. However, there have been recent advances showing MRI evidence of ligaments looking more like normal ligaments after a precise stem cell injection. We are the group that pioneered this technique. In addition, we have a lot of experience with returning our athletes to play quickly, and particularly with ACL stem cell injections, our athletes seem to get off the bench much faster than they do following surgery. Just look at the chart below comparing ACL surgery to ACL stem cell or PRP treatments (click on it to enlarge). The upshot? Over the years, we have treated many professional athletes, such as MLB and NHL players, as well as nonprofessional athletes who are simply dedicated to their sports or fitness goals. Some are high school or college athletes on the sure path to the NFL or some other professional league, while others are competitive fitness professionals or even middle-aged competitive athletes determined to stay strong and fit as they age. We’ve seen many, many success stories from our athlete patients following their treatment with stem cells, platelets, or other advanced orthobiologics. And in our opinion, when it comes to our athlete patients, nothing measures success better than a happy, pain-free athlete who’s back in the game. Very, very interesting insight. Do you have any other sources for me to read further and to be able to dig a little deeper?